Excel Tip: Calculating Interest » Accounting Advisors, Inc.
Microsoft Excel is an ideal tool for calculating the cost of borrowing money, but are you doing so in the most efficient manner? 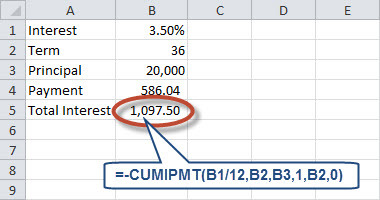 In this article, I'll describe how you can use the CUMIPMT function to calculate interest expense for a loan, whether for a month, a year, or the length of the loan – all within a single worksheet cell. I'll also show you how to add an amortization schedule to any workbook with just a couple of mouse clicks. nper – The length of the loan in months. pv – The amount being borrowed, also referred to as the present value. Figure 1: The PMT function calculates the monthly payment for a loan. As shown in Figure 1, a monthly payment of $586.04 for 36 months is required to pay back $20,000 at an interest rate of 3.5 percent. 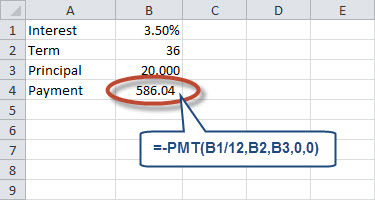 The PMT function always returns a negative amount because Excel sees the payment as an outflow. I omitted the 2 optional arguments, so in this case, the PMT function assumes the loan is paid to 0 and payments are made at the end of each period. start_period – The starting month from which to calculate interest on the loan. Use 1 to calculate interest from the start of the loan, or 13 to calculate interest for just the second year of the loan. end_period – The ending month through which to calculate interest on the loan. Use the same value as the nper argument to calculate interest for the life of the loan, or 24 to calculate interest for just the second year of the loan. type – Specify 0 to indicate that payments are made at the end of the period, or 1 for payments made at the start of the period. Figure 2: The CUMIPMT function computes total interest for all or part of a loan. As shown in Figure 2, the CUMIPMT function shows that borrowing $20,000 at 3.5 percent for 36 months will cost $1,097.50. Although not shown, the cost for the second year of the loan is $368.55. To calculate the principal paid back for a given portion of the loan, use CUMPRINC, which utilizes the same sequence of arguments as CUMIPMT. As you can see, it's possible to use worksheet functions to calculate interest and principal for all or part of a loan without building out a full-scale amortization schedule. However, when one is needed, right-click on any worksheet tab and then choose Insert, as shown in Figure 3. Click on the Spreadsheet Solutions tab, and then double-click on Amortization Schedule. 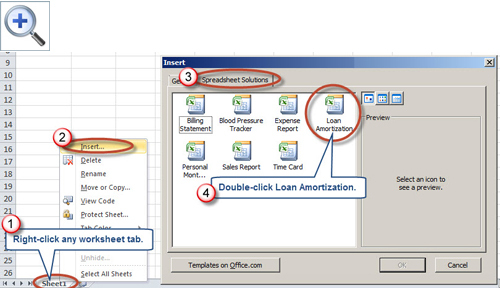 Figure 3: Add an amortization table to any workbook with just four clicks.